Is it beginning to look a lot like Christmas where you live? 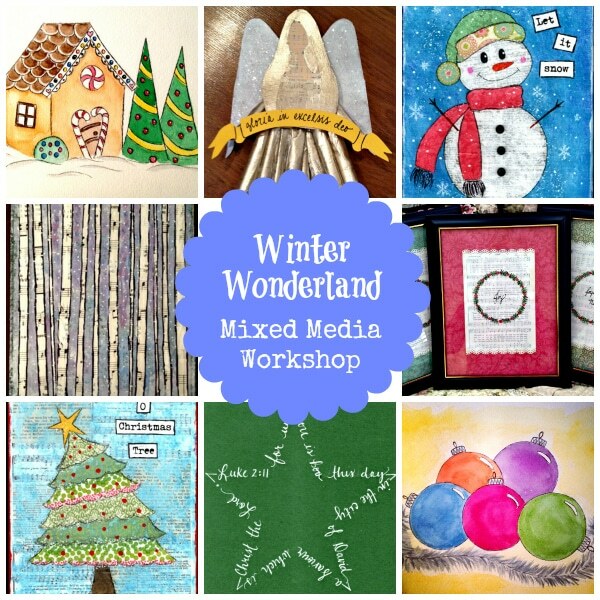 This is the time of the year in which if we’re not careful, we can get so busy planning, baking and shopping that we forget to set aside some special time to create with our kids. 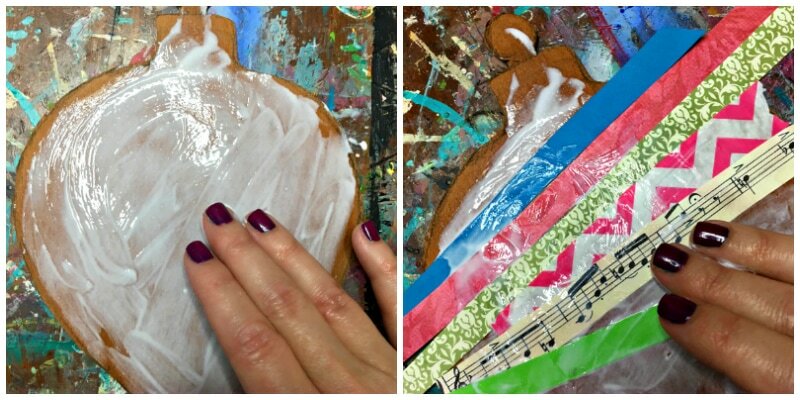 But art is a great way to relax, rejuvenate, and relieve some seasonal stress (that is, if you don’t mind the mess). 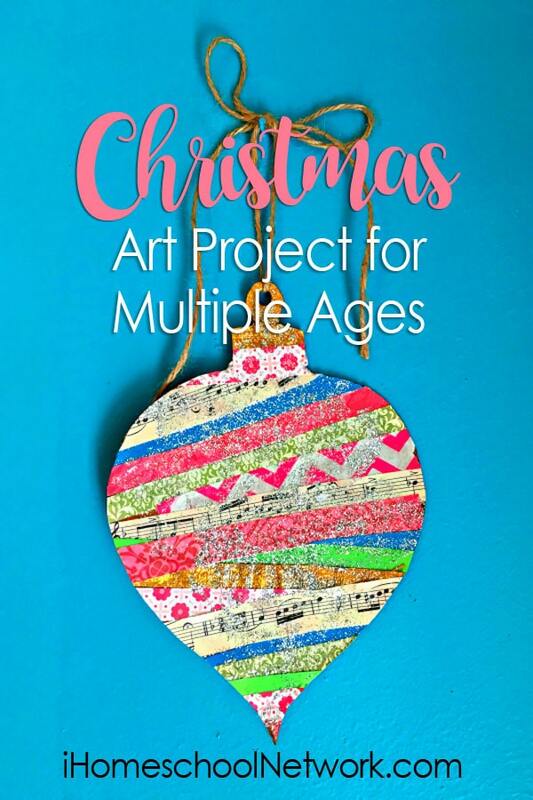 Below I have a fun and easy Christmas art project that’s adaptable for multiple ages. Plus, you can use it as a springboard for more elaborate creations with your more artsy kids. 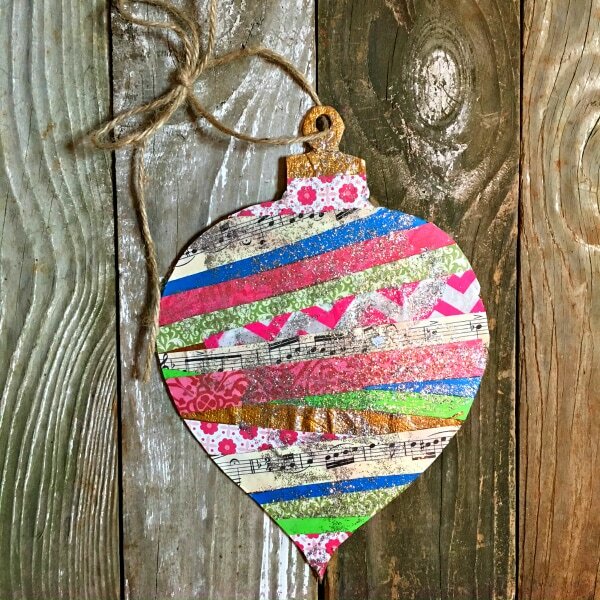 Step 1: Draw the shape of an ornament on the board and cut out. (To keep it super simple, use a saucer or lid and draw a round ornament.) I sketched a large sized ornament – approximately six inches long. This makes a great bedroom door hanger. 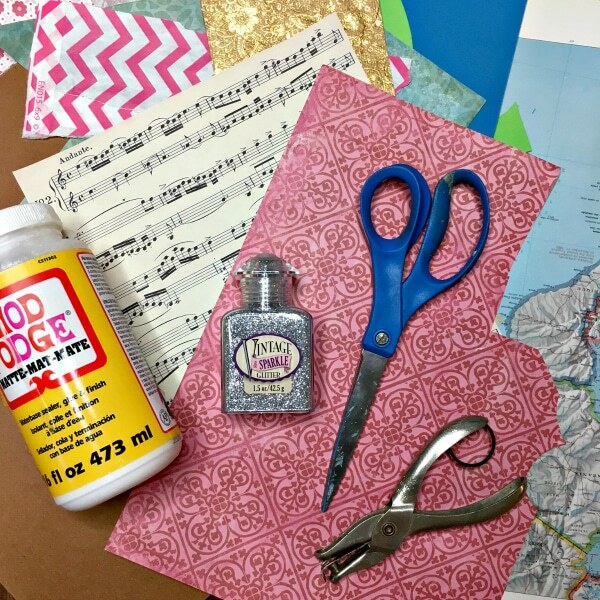 Step 2: Apply a coat of ModPodge over cardboard, then arrange the paper strips on the board in any pattern you like (I applied them in a wonky, whimsical pattern). 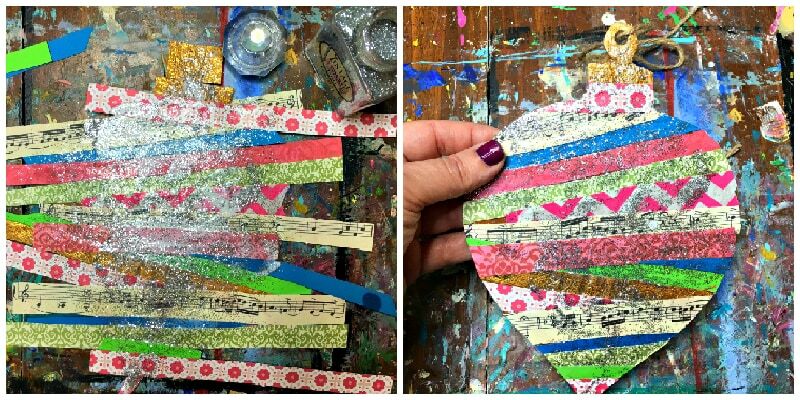 Cover the strips with a second coat of ModPodge. Step 3: While the glue is still wet, apply glitter (optional). Allow to dry, then repeat process on other side if desired. If you have an aversion to glitter (don’t worry, I won’t judge), use a permanent black pen or Sharpie to outline the different stripes and add more definition to them. 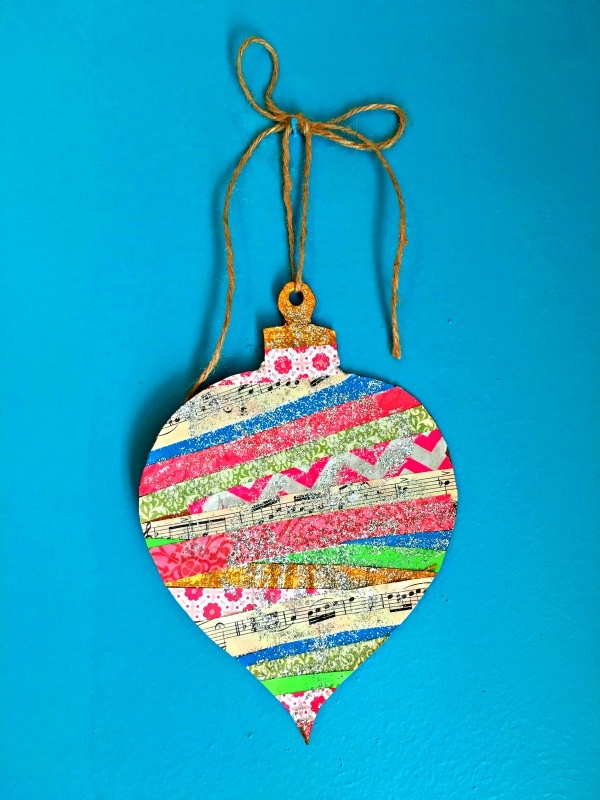 Step 4: Once ModPodge is completely dry, trim the edges of the strips of paper, punch a hole in the top of the ornament, then string your twine through it. Step 5: Hang the over-sized ornament on door or wall. Or, encourage kids and teens to create several ornaments in various shapes, sizes and patterns to hang from ceiling with fishing wire and create a festive environment in their bedroom. 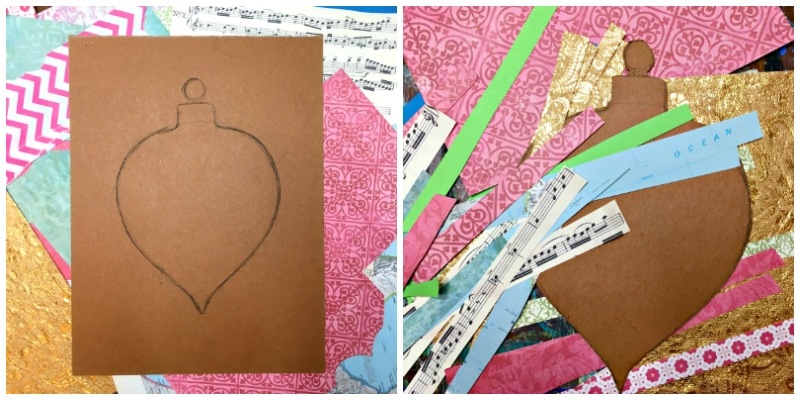 Alisha Gratehouse is an artist, art instructor, minister’s wife, and homeschooling mom of three. Her days are filled with creating, writing, drinking tea, laughing with (and at) her family, and spontaneously bursting into song.